His career began with Southern Television in 1964 on a children’s programme called ‘Three Go Round’. And he’s been trying to get it right ever since! In the late 1970’s for a brief period he covered regional sport for Yorkshire Television. He also appeared as a relief presenter of the networked ITV Saturday afternoon show “World of Sport”. By 1966 he was appearing on a variety of programmes, including Southern’s nightly news/magazine programme Day by Day - and ‘HOW?’ the longest-running children’s programme on ITV. Fred also did a lot of network sport and was ‘front-man’ for ITV at two Olympic Games. By 1984 he was co-presenting Coast to Coast’, the TVS nightly news/magazine programme and, when Meridian took over in 1992 he took over the reins on Meridian Tonight. So he’s been in TV for 45 years - and fronting the six o’clock programme for the past twenty five. Dinenage became co-anchor of a new pan-regional edition of ‘Meridian Tonight’ in February 2009 presenting alongside former South East anchor Sangeeta Bhabra. 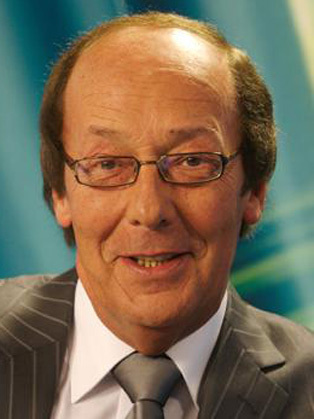 Alongside his television career, Dinenage has written several factual books including ghosting on autobiographies ‘My Story’ and ‘Our Story’ for the Kray Twins. He is a keen follower of Association Football and was on the board of Directors at Portsmouth FC for a number of years before retiring at the end of the 2005/6 season.